Product prices and availability are accurate as of 2019-04-02 15:27:26 EDT and are subject to change. Any price and availability information displayed on http://www.amazon.com/ at the time of purchase will apply to the purchase of this product. Primera Bravo 4100-Series Ink Cartridge Multi Pak Set (#53606): These high capacity cartridges contain dye-based ink for use with the Primera Bravo 4100, 4101, 4102, 4101-Blu and 4102-Blu Disc Publishers. 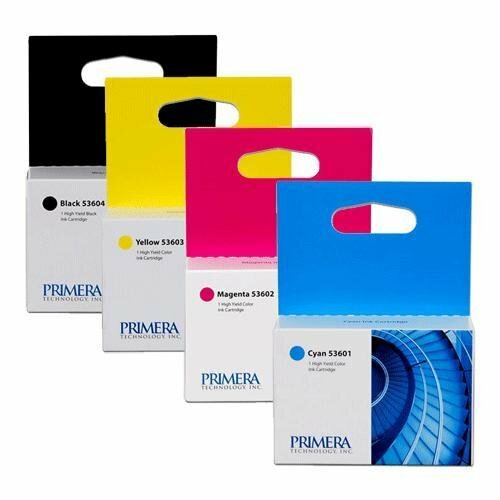 Set includes 4 cartridges: 1 Cyan (#53601) 1 Magenta (#53602) 1 Yellow (#53603) 1 Black (#53604).